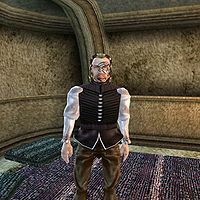 Allding is a Nord pawnbroker who buys and sells wares at The Rat In the Pot in Ald'ruhn. He's a member of the Thieves Guild and recently got into a bit of trouble for stealing something from the wrong person. He wears a common shirt and pants along with a pair of expensive shoes with a matching belt. He caries an iron shortsword, longsword, warhammer, spear, war axe, 20 throwing knives, 75 arrows, and 3 torches. Aside from his natural resistance to shock, immunity to frost, ability to shield himself, and a natural frost damage spell, he knows no spells. If you ask him about Enamor, he'll tell you: "Yeah, that was me. I didn't know Gentleman Jim was such a big fan of Dunmer poetry. He chewed me out for an hour and even recited some of Salyn Sarethi's poems. I won't make THAT mistake again." Enamor: Return Enamor to Salyn Sarethi at the Tower of Dusk. This page was last modified on 21 March 2017, at 18:14.